I'm a big Doctor Who fan who loves various aspects of the British Science Fiction tv series as you can see from the picture above. 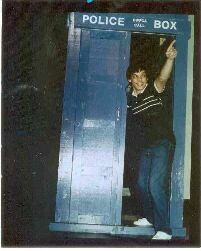 The photo was taken in 1982 at The New York Doctor Who Festival. You can find web pages to Doctor Who in the links section. SCI-FI REVIEWS HERE!!! !